Orvieto was wonderful; its wi-fi connection was not. So we will save the narrative and photos for that leg of our journey until uploading is not so arduous. Those on the tour that were not doing the Orvieto pretrip arrived on Saturday night. Becky, who came from California, arrived minus her luggage. She and the thunder storms hit the east coast around the same time, so her journey was by far the most exciting, although Bud and Ruth also had a story to tell about their flight from Philadelphia. Seasoned travelers all, they took their adventures in stride. I, on the other hand, was quite glad to have been spared the experience. 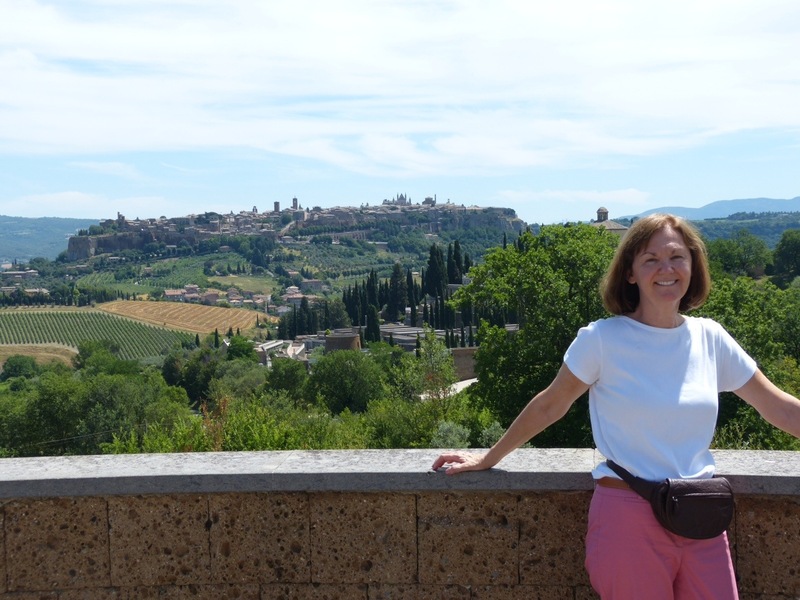 We stopped on our way out of Orvieto for a photo-op. 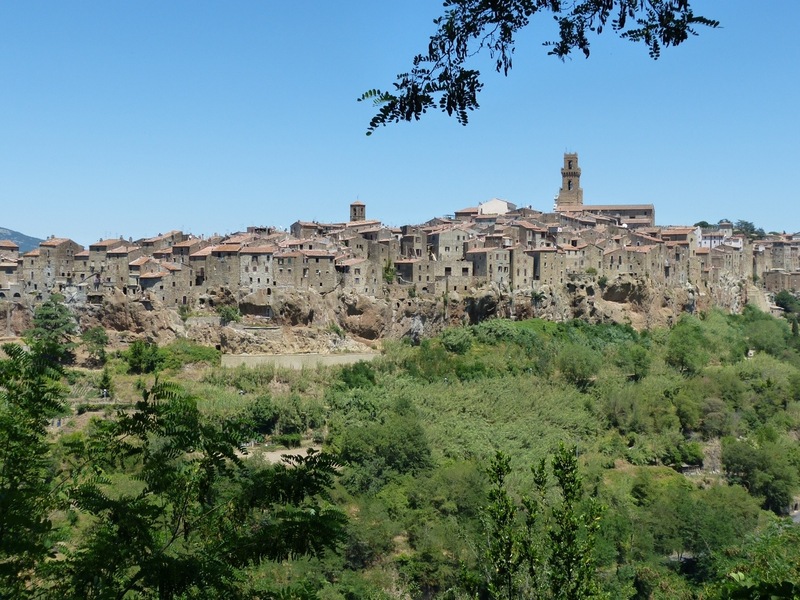 Lunch was in the little fortress town of Pitigliano, and offered yet another departure photo-op. 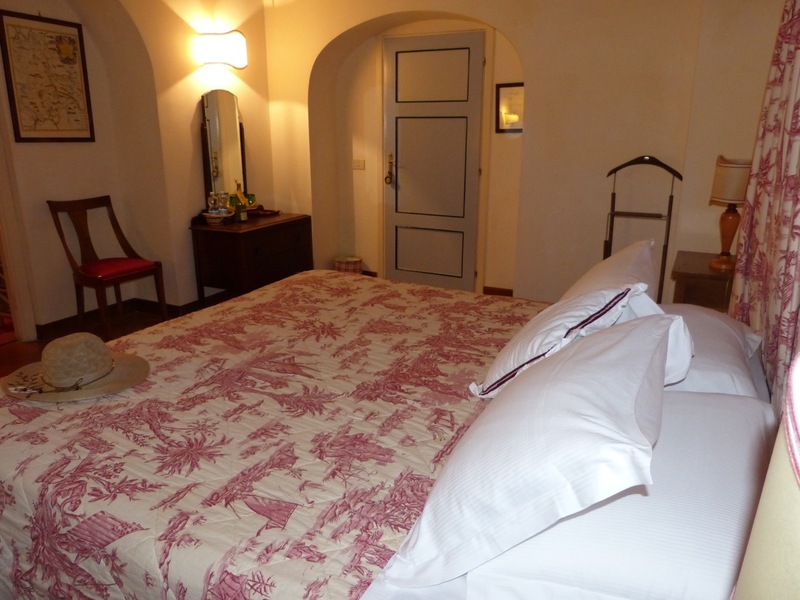 Next stop, our beautiful 4 star resort, Antica Fattoria La Parrina. This “farm” produces its own wine, cheese, yogurt, vegetables, oil, balsamic vinegar, organic pasta, jams and sauces which we would soon be sampling. We were greeted by Astrid, who served us wine and cheese while our luggage was being deposited in our rooms. I’m not normally a white wine fan, but their’s is delicious. So is their red, so I drank both. Check out my gorgeous room. 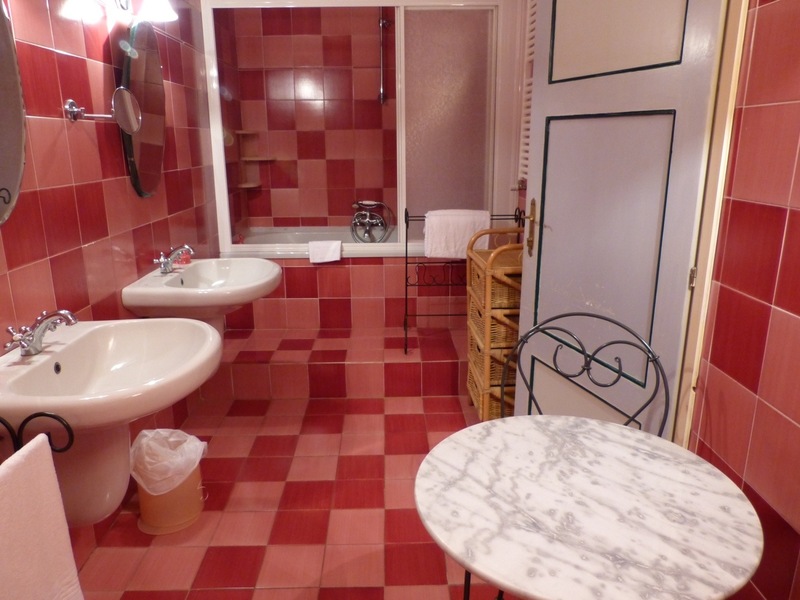 I’m a little mystified by the table and chairs in the bathroom. Am I supposed to invite my two best friends in for tea while I take a bubble bath? We met our team leaders, Franco and Angelo for a safety briefing. After they finished telling us about the fast moving traffic, I looked at Beth to see if she was as terrified as I was. When they said fast moving traffic, I visualized NYC, but fortunately their definition of traffic is quite different from ours. There are 20 of us bikers, and as with our last VBT trip, it didn’t take long for us to feel like we had been friends for years. Getting lost is a particularly bonding experience. Plus the wine helps. We had a short introductory ride to get used to our bikes. Well, short for some, longer for those that are directionally challenged. Can you guess which group I fit in? Dinner was a typical Italian event that lasted for hours with glorious food, lots of wine, great company. This could be habit forming! 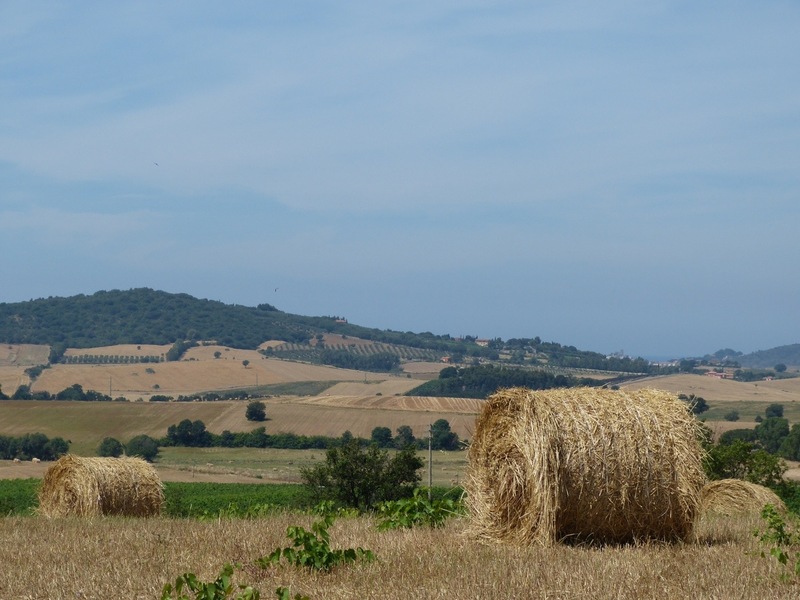 Today’s ride took us through the Tuscan countryside. This is postcard worthy scenery. Those hills are beautiful, but they are a bit of a challenge for some of us. Wow I am so envious, have seen the film “Under The Tuscan Sun” hundreds of times! I too am a fan of Under the Tuscan Sun. The food is amazing. I’m overdosing on fruit, vegetables and gelato! Wish you and the other sombrero sists were here too. Oh Cinderella, I miss you. This is the first time I got to see/hear about your wonderful adventures. It sounds like Antica Fallona La Farria – I think I got the spelling wrong – has all the comforts of home. The table and chair in the bathroom is probably not for anyone to come and have tea with you but to perhaps allow you to place valuable items ie. keys, phone, camera so they don’t get loss. We are having a heat wave – in the 90’s and it is not real comfortable. Hope you continue to have a wonderful time with old/new friends. Can’t wait to talk with you on the phone in 15 days, 18 hrs and 44 minutes. PS – did you fly over the same Atlantic ocean that Gillian and the Skipper too doddodododoooo sailed on? Don’t tell her you can fly in less than 5 days.I can see you are going to call her first to tell her all about your vacaction before the see the sombero’s sisters. Now the hays stack – if I didn’t know better I’d think it is where they got the needle in the haystack from. Did you and your friends roll it? Miss you too! Hope to get a good connection at the villa. Will be there tonight.